Part of a 1,000-acre master-planned community, the 329-room Park Hyatt Aviara Resort overlooks the Pacific and the coastal wetlands and wildlife preserve of the Batiquitos Lagoon. The development has seven tennis courts (5 hard, 2 clay, one of them a stadium), an 18-hole Arnold Palmer golf course, two swimming pools, a fitness center, and a spa. Director Steve Halverson has presided over the tennis center since it opened in 1997. He had played tennis for Oregon State University and then went on to coach its women's tennis team before joining Peter Burwash International. His work with PBI—including a stint coaching the Indonesian tennis team—took him to 50 countries. He can teach in English, Spanish, French, and, if you need it, Indonesian. He currently oversees PBI's international wheelchair program. 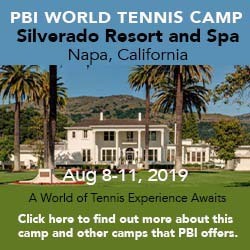 At Aviara, he weekly calendar includes hour-long adult clinics and after-school kids clinics (which the children of hotel guests are welcome to join) as well as guaranteed game matching, and he has a broad range of options for corporate and custom tennis events. Courts & Fees. The six lighted courts—one of them a stadium with terraced seating—spread through a landscaped garden adjacent to the golf clubhouse and a shuttle ride away from the hotel on a mesa above. The complex also has a small but full-service pro shop. Court Fees: $35/hour. Beach. The resort is inland from the Pacific; however, paid shuttle service is available daily to Moonlight Bay Beach. Golf Courses. Arnold Palmer designed the 18-hole Aviara Golf Club to make the most of the rolling hills and views of Batiquitos Lagoon. The LPGA's Kia Classic is held here. Custom club fittings are available through the golf club's TaylorMade Performance Lab. Spa. The 15,000-square-foot Aviara Spa has 20 treatment rooms devoted to "bespoke" treatments—that is, customized programs for each individual spa-goer. Before and after, guests can take advantage of an indoor solarium as well as whirlpools, saunas, and steam rooms. The spa also contains a modest fitness center staffed by personal trainers. Aviara Kids Academy by Camp Hyatt operates on select dates from Memorial Day to Labor Day and takes children 4-12 for a full- or half-day of activities, arts, and crafts. That said, San Diego has its own attractions for kids, among them Legoland and the San Diego Zoo. The decor is chic and modern, but the best part of these oversize rooms in the terrace, which depending on the location variously overlooks the foothills, swimming pool, golf fairways, or lagoon. There is live music Monday to Saturday in the hotel's lobby lounge, after which you can head for Vivace for Italian cuisine, Argyle Steakhouse in the golf clubhouse, or California Bistro for farm-to-table Southern California specialties. There is also a poolside bar and grill. The hotel has 329 rooms and suites, each with a private balcony or landscaped terrace with views of the golf course, lagoon, or mountains. General Tourist Information. There are three sources of information: in the immediate area, visit the Carlsbad Convention & Visitors Bureau website (or contact them at 400 Carlsbad Village Dr., Carlsbad, CA 92008, phone 800-227-5722); for this part of the county, visit the San Diego North Convention & Visitors Bureau website or contact them at 360 N. Escondido Blvd., Escondido, CA 92025-2600. Phone: 800-848-3336; and for the county as a whole, visit the San Diego County Convention & Visitors Bureau website or contact them at 2215 India St., San Diego, CA 92101. Phone: 619-236-1212.